We spent 40 hours over a 30 day period researching and testing more than 12 different kinds of baby multivitamins and found that safe ingredients, ease of administration, and brand reputation were the most important factors for consumers who were shopping for a baby multivitamin. NovaFerrum Multivitamin with Iron Supplement for Infants and Toddlersscored high marks in all categories and is our overall top pick. This yummy tasting multivitamin features a raspberry grape flavor that little ones love. It contains no alcohol, dyes, sugar, parabens, or lactose and is Kosher and Vegan verified. Your baby will get 100% of the daily value of the vitamins they need including B, D, and A. All parents want their babies to thrive and be as healthy as they can be. One way to do this is through a carefully selected diet but a perfect diet is hard to manage sometimes. When the diet is lacking a good way to help make up for this is by using a quality baby multivitamin. Having the right vitamins and minerals every day is crucial for healthy teeth, strong bones, and also helps to prevent anemia due to low iron; a common problem in infants and young children. The market is full of different types of baby multivitamins. With all of these different choices available is can be overwhelming trying to figure out which multivitamin is the right one for your baby’s needs. That is where we can help. We have provided you with a couple of tools that will make the baby multivitamin search less stressful and confusing. From our extensive research and testing we have found the three top-rated baby multivitamins on the market and provided their reviews below. These reviews will allow you to learn about their features and benefits so you can determine if any one of them is right for your baby’s needs. In addition, we have included a buying guide that will list what to look for when selecting a baby multivitamin, what to avoid, and give you some information on how to decide if your baby will benefit from a multivitamin. This information does not replace the advice and recommendations of a pediatrician and is not medical advice. Always check with your baby’s doctor before giving them any kind of vitamin or supplement. 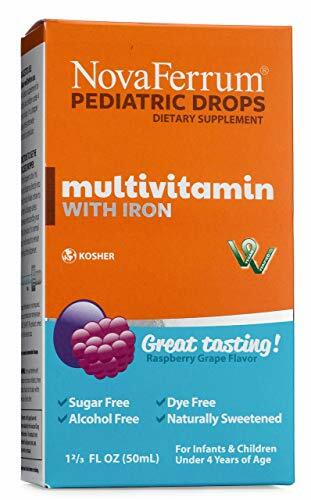 If you are looking for a popular baby multivitamin that does not contain sugars, dyes, dairy., parabens, alcohol, lactose or any other potentially harmful substances, NovaFerrum Multivitamin with Iron is an excellent choice. The raspberry grape flavor is a favorite with babies and toddlers so there is no struggle when giving it to them each day. There are no Iron salts in this product. The main ingredient is derived from a polysaccharide-iron complex. NovaFerrum baby multivitamin is Vegan and Kosher verified and provides 100% of the daily requirement of 8 vitamins that are essential to your baby’s health including D, A, and B.
Enfamil is a well-known, established company in the baby industry. 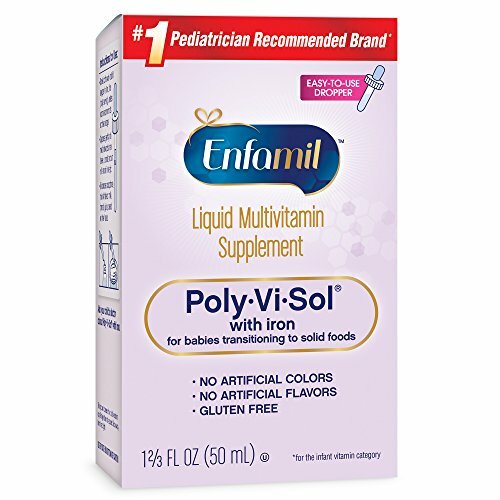 They are most known for their line of healthy baby formulas but they have other products as well including this Poly-Vi0Sol with iron baby multivitamin. They also have a baby multivitamin that does not contain iron if that is what is recommended by your pediatrician. You can give these vitamins to your baby directly into their mouths via the included dropper or mix is with juice, formula, cereal or other foods to encourage easy acceptance. Poly-Vi-Sol contains the vitamins that your baby or toddler need to be healthy including E, C, A, D and some of the important B vitamins. All of the Enfamil baby vitamins contain no artificial flavors or colors and are gluten-free as well. Zarbee’s Naturals baby multivitamin is an effective and safe vitamin that was created by a pediatrician. It is a great choice for parents looking to add nutrition to their baby’s diet that they may not be getting through the food they eat. There are 9 vitamins in Zarbee’s baby multivitamin including D, A, and C and contains iron. They also have a baby multivitamin that contains no iron. There are no artificial flavors, dyes, artificial flavors, gluten, or drugs in this baby vitamin. It is made with agave syrup and features a natural grape flavor that babies usually respond well to although it can be strong for some baby’s tastes. Mixing this vitamin with the baby’s drink or food can soften the strong iron taste. This product is designed for babies 2 months old and older. 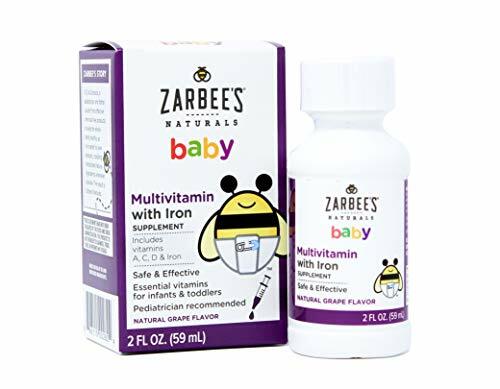 Zarbee’s Naturals baby multivitamins are made from wholesome ingredients that taste good and contain no artificial colors, chemicals, flavors, or dyes and is also gluten-free. This effective multivitamin comes with a convenient plastic syringe so you can ensure you are giving the correct dose; makes it easy to administer to babies as well. These three top-rated baby multivitamins are all quality vitamins that offer everything your baby needs to grow, be healthy and strong and happy. All of these baby multivitamins are from well-known companies that are trusted and popular in the baby industry. Taking the time to learn about baby multivitamins and shopping for the right ones is the best way to ensure you will be giving your baby a quality product that will give them the vitamins and nutrients that they may be lacking from the food they are eating. Baby vitamins do not replace good nutrition but they are great resources for filling in the gaps that their diet may have. With all of the different baby vitamins on the market, there is plenty to choose from that will give your baby exactly what they are lacking. Once you are ready to purchase a baby multivitamin, considering one of the three top-rated selections we have reviewed above is a great place to start. If you do not see what you are looking for in these three selections we have added 6 more baby multivitamins that you can consider. Many pediatricians will tell you that most babies that are growing the way they should do not need vitamins. In today’s society, where fast food and processed foods from the grocery store can be a regular meal, vitamins are necessary to fill in the gaps that your child may not be getting from the food they are eating. If you feel like your children is eating plenty of vegetables, fruits, healthy meat or protein sources, and getting all the vitamins they need from these wholesome, preferably organic foods then you are probably good as long as your baby is growing and gaining weight properly. If you’re like the majority of people that are working a lot of hours and feeding the kids and yourself whatever you can grab the fastest, it is a good idea to talk to the pediatrician about adding a quality baby multivitamin to your child’s diet. There are many reasons that you should consider a baby multivitamin for your baby. Below we have listed many things for you to think about while you are contemplating this decision. These are also things you can bring to the pediatrician to discuss when you talk to them about a multivitamin for your baby. There are many benefits that a quality multivitamin can provide for your baby. They can help grow healthy and strong teeth and bones that are very important for overall health throughout life. They are also very good for mental wellness also. If you are concerned about the strength and health of your baby’s teeth, there are many multivitamins that contain fluoride drops that are one way to handle this issue. If you are imagining that administering vitamins to your baby is really difficult, there’s nothing to worry about. Manufacturers that create baby vitamins have created drops that are super easy to give your young ones. The bottles come with droppers that are marked for dosage amounts so giving them the right amount is easy and fast every time. There is so much processed food on the market these days that it is natural to worry and wonder if your baby or toddler is getting the right nutrients and vitamins they need. These processed foods can contain a lot of chemicals which is something parents want to avoid. Choose a multivitamin that contains none of these harmful chemicals and that is free of artificial colors, flavors, dyes, and other artificial ingredients that are not good for your child. Some children are born with deficiencies such as lack of iron. Although babies receive all the iron they need from their mothers in the last trimester that will typically last through until they are four months of age, breast milk does not contain the right amount of iron and the baby can become deficient. Your baby’s pediatrician can advise you on the amount of iron your baby needs and may recommend a multivitamin that contains iron or will just recommend an iron supplement. The type of vitamin that your baby needs will depend on any specific health issues or deficiencies that your child is dealing with. If there are no health issues then a regular baby multivitamin is fine. Is there are specific food styles such as vegan or vegetarian, then certain vitamins like calcium, B12, D and riboflavin are necessary. Below we have listed the most commonly supplemented vitamins that babies need and what situations might determine their addition for your baby’s diet. Vitamin D – It can be really difficult to ensure that your baby gets enough vitamin D. The best source of vitamin D is exposure to sunlight on the skin but since babies’ skin is so sensitive they can’t be exposed to it sufficiently enough to gain the vitamin D benefits. There are some other sources of vitamin D in foods such as eggs, fish, and some cereals but the best and easiest way is to supplement with a multivitamin that has the recommended amount included. It is recommended by the American Academy of Pediatrics to give a breastfed baby 400 IU of vitamin D as early as the first few days of life, per day. Formula-fed babies usually have enough since vitamin D is in the formula but if they drink less than 32 ounces a day, they should also have the 400 IU per day supplement. Babies should not be exposed to sunlight until after 6 months of age regardless of where you live and once they are older and are using sunscreen, the sunscreen blocks the sun’s rays that enable the body to produce the needed vitamin D.
Vitamin A – Vitamin A is important for a strong immune system, vision health, and healthy skin. If your child does not eat dairy or they don’t like dark green veggies, or other food sources that are rich in vitamin A such as sweet potatoes, carrots, and mangoes; they will need a multivitamin that contains vitamin A which most do. Vitamin C – Vitamin C is pretty easy to get through food sources especially if your child loves oranges, kiwi, strawberries, and other sources. Many multivitamins have vitamin C added which will take care of any deficiencies that the child has from diet alone. Iron – Breast milk and formula contains iron but once your baby starts on solid foods the daily iron requirement jumps up to 11 mg daily for babies age 7-12 months. Once they reach this age it is important that your baby receive enough iron to prevent anemia. If the baby doesn’t eat enough foods that are iron-rich the pediatrician may recommend adding an iron supplement or suggest a multivitamin that contains iron. Premature babies typically need extra iron regardless of the diet they have. Vitamin B12 – Vitamin B12 is very important for your baby to prevent anemia and for the healthy development of the baby’s nervous system. B12 comes from poultry, eggs, meat, fish, and milk products. If you follow a vegetarian or vegan diet it is very important to have a reliable source of this critical vitamin. Most baby multivitamins contain B12 or B complex vitamins. DHA – Omega-3 – fatty acids are very important for healthy eye and brain development. If a breastfeeding mother gets enough fatty acids in her own diet the baby will get what it needs through the breast milk. Formula is fortified with DHA also. Although DHA supplements are not usually recommended for babies if they are breastfeeding, the mother may want to consider adding a supplement to her own diet to ensure the baby is getting enough. Babies of vegetarian or vegan mothers have been shown to have lower levels of DHA than babies of mothers who consume meat. Fluoride – Once your baby starts getting his or her teeth it’s time to ensure that they are getting enough fluoride. It is better to give your baby water that has been fluoride rather than the supplements since they can stain the teeth permanently. If there is not adequate fluoride through their water talk to your pediatrician to find out if your baby needs a fluoride supplement. There are many ingredients in some baby and children’s vitamins that are known to cause all sorts of problems and discomfort because these ingredients can’t be digested by the body sufficiently. Below we’re going to go over these ingredients that you should avoid for your baby and yourself. Mannitol & Sorbitol – These are sugar alcohols that have been known to cause discomfort and digestive issues because the body can’t digest them properly. Carrageenan – This emulsifier thickens products and has been linked to digestive issues, and high inflammation levels in the body. Maltodextrin – This ingredient indicates that the food or supplement that contains it is highly processed. It is used as a preservative, thickener, and filler in many of the processed foods on the market. It has a high glycemic index that can cause your blood sugar spikes. Artificial Colors – Ingredients like Red #40, Blue #2, and Yellow #6. These have been linked to a variety of health problems including learning impairments, aggressiveness, allergies, irritability, and hyperactivity. Artificial Flavors – These are also very processed and do not belong in a kid’s vitamin. Sucralose and Aspartame – Diet sodas are sweetened with one or both of these ingredients and are surrounded by a lot of controversy. Research has not been able to prove definitively whether they lead to long term health issues but what has been proven is that they cause insulin responses in the body. Avoid baby multivitamins that have these ingredients in them. Monoglycerides and Diglycerides – These are commonly used emulsifiers that keep oils and fats from separating. This is another indicator that these vitamins are processed. Gelatin – Gelatin is not a harmful ingredient but it is not a necessary one and if you follow a vegan or vegetarian diet, it is important to know that gelatin is not veggie-friendly. Once you have determined that your baby needs a multivitamin by talking about the baby’s diet with your pediatrician, it’s time to start sorting through all the different options on the market so you can eliminate the ones that do not want to give your baby. With so many different choices available, we made it much easier to recognize the good baby multivitamins from the ones that contain ingredients you want to avoid. The three top-rated baby multivitamins we have reviewed above are all excellent examples of quality baby vitamins that do not include the ingredients you want to avoid and are easy to administer to your baby. They are good tasting, cost effective, and contain the important vitamins that your baby needs. If you are looking for baby multivitamins quickly and want to ensure a good quality product, any one of these selections will be perfect. The information you have been given in the buying guide has provided you with the ingredients that you want to avoid so be sure to read those labels. You have also gotten more information on the important vitamins that your baby needs to be strong and healthy. This information is not intended to replace the medical advice from your pediatrician so make sure that you include them in your questions and research for baby multivitamins. With all of the right information, like what we have provided in this guide, you will be able to make a confident decision on a baby multivitamin that you feel good about and know is safe for your baby.